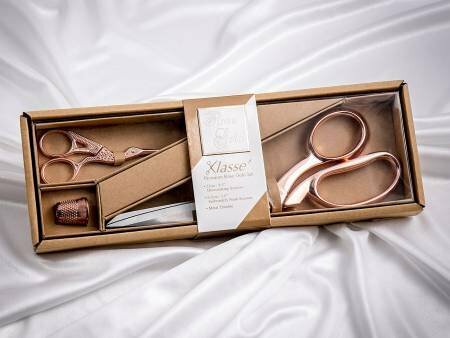 This Klasse Rose Gold Premium Gift Set is presented in a high quality window gift box. This set is sure to grab attention wherever you use it. Set includes 8-1/2in dressmaking stainless steel scissors, 3-1/2" embroidery stork stainless steel scissors, and a steal metal medium size thimble. Item demensions: 10-5/8in x 3-3/4in x 1"